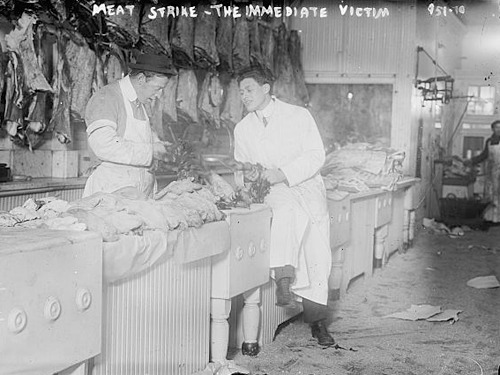 Two of my ancestors were butchers who immigrated to America from Germany. My great grandfather Berend Petermann's occupations were mostly connected to seafaring and working on docks. However, at one point when he first arrived in the United States he was listed as a bucher. I do not know if he had his own establishment or worked for someone else. For a while I entertained the idea that he worked in a slaughter houses or a wholesale butcher. But I have no real reason to suppose this is true. Another ancestor, Peter Goehle, was continually listed as a butcher. 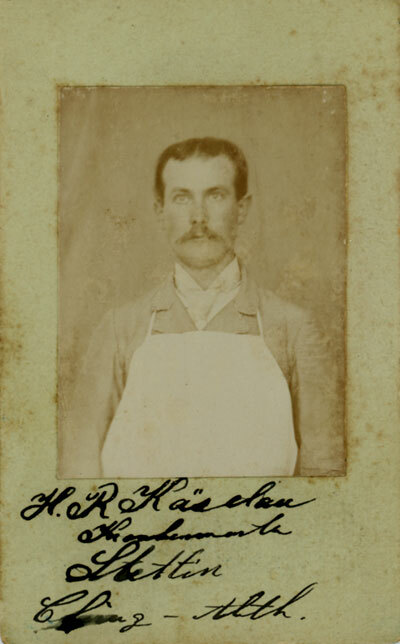 At his marriage in 1875 his occupation was "butcher". In 1910 he was a butcher in a store. In 1915 he was listed as a janitor. 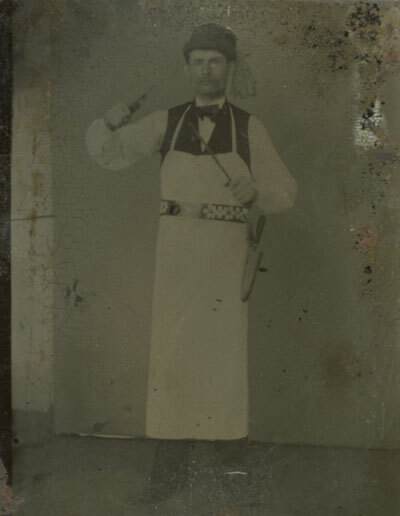 The butcher is often depicted in a long white apron. White is the preferred color of the clothing of a number of professions connected with the food industry. Perhaps it is because white fabric is bleachable. Instantaneous Photo view Company 757 3rd Avenue N. Y. stamped on back "around 14th and Ave A NY" written in pencil on back. 757 3rd ave is around 47th street. 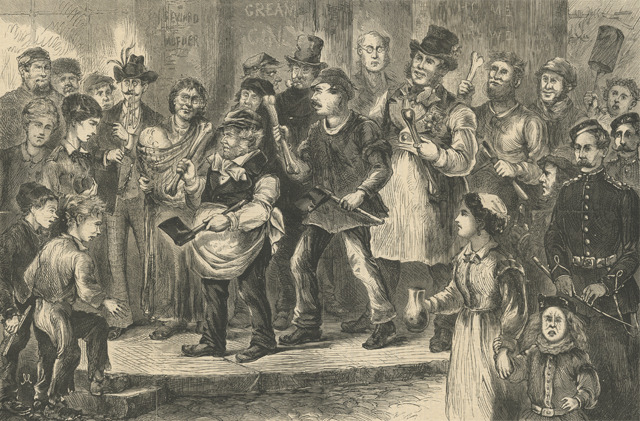 This image represents the "ringing of the bones" using cleavers and bones to celebrate the marriage of a butcher by other members of his trade. The custom was known in certain sections of England. 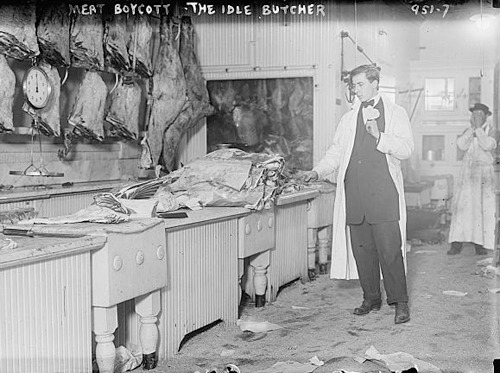 The 1910 meat boycott was a workingman's movement protesting the high cost of meat. It was supported by several large unions. The movement started in early January in Cleveland where protestors signed a pledge to abstain from meat for thirty or sixty days. The boycott quickly spread across the country with hundreds of thousands of men and women taking the pledge. Large meat processing companies like Armour and Swift were accused of fixing prices. 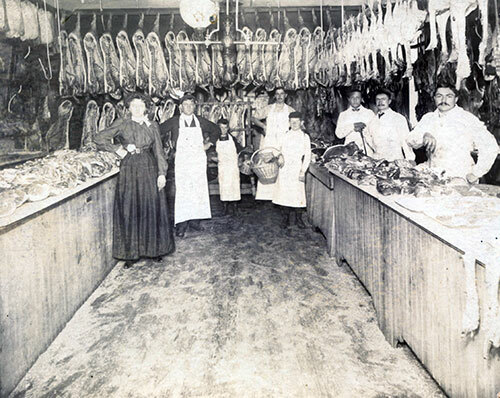 The immediate result was a reduction of prices as local butchers sought to unload the stock at hand before it spoiled. The large processors and packers simply curtailed production or shipped their products out of the country. Prices soon retuned to what they had been. Many health food advocates took the opportunity to point out that Americans ate much too much meat and would be healthier with less meat in their diet. 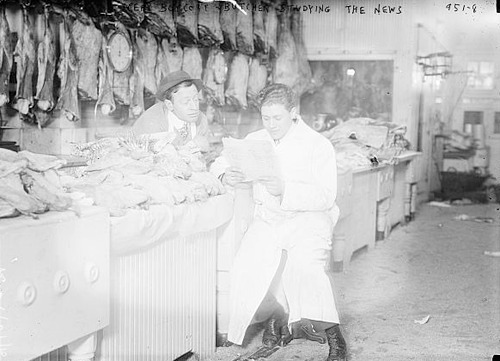 A New York butcher who had been in business for over 30 years said that prices of meat in 1910 were higher than they had been since 1865/66. 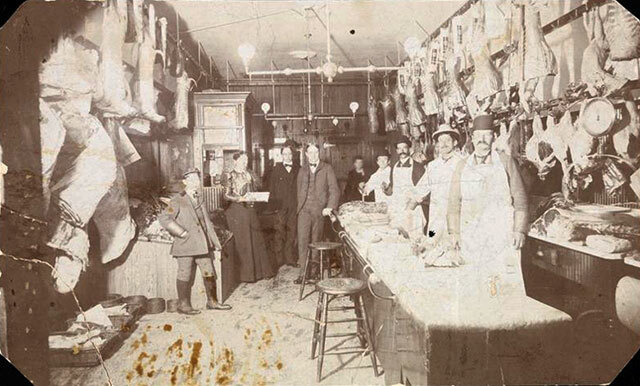 However, despite the images below, butchers in New York City were said to have been as busy as usual. 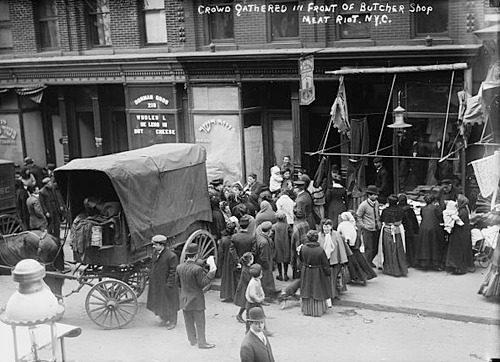 In April 1910 there were disturbances known as the "kosher meat riots" in the Bronx and the Lower East Side. A mob of several hundred women, starting at sundown marched from Sixth Street and Avenue B down Clinton Street, and then though various streets further east, closing butcher shops all along the route. For the most part the butchers, at them mere sight of the oncoming crowds grew sufficiently alarmed to turn down the lights in their places and close the doors". Some shop windows were broken. This disturbances were in protest over the high cost of kosher meat. The issue not only involved the meat packers but the certification of the meat as kosher. 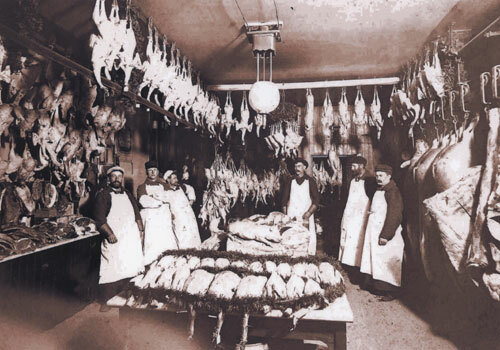 Demand for kosher meat increased 70% between 1900 and 1909. 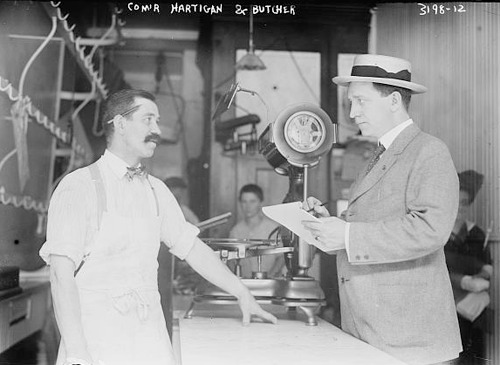 Photograph shows Commissioner Joseph Hartigan of the Bureau of Weights and Measures in a store, while investigating the prices of food in New York City at the beginning of World War I. Fear that the war would encourage profiteering and hoarding commissioner Hartigan sought to assure the population that every effort would be made to keep priced down and availability high. Despite these assurances prices did rise and by 1916 food shortages were reported. The exportation of dressed meat and live stock from America to Europe has lately grown into an extensive business. 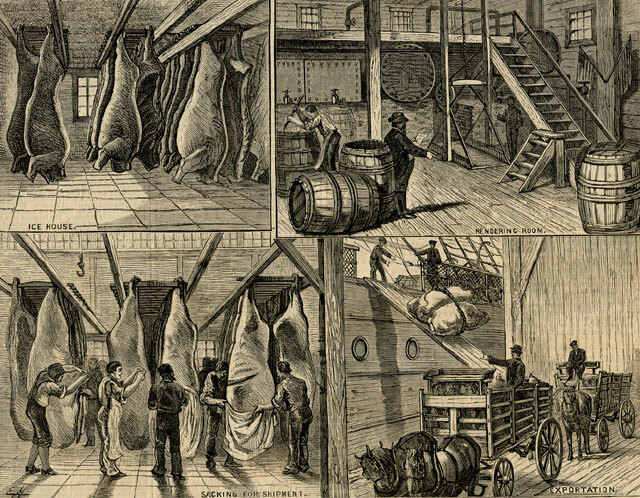 Less than two years ago the experiment was first tried of placing the beef and mutton of this country in the markets of Europe, and after much doubt and opposition a New York firm succeeded in sending a cargo of this perishable freight to England and landing it is such good condition that it readily sold, realizing a handsome profit. 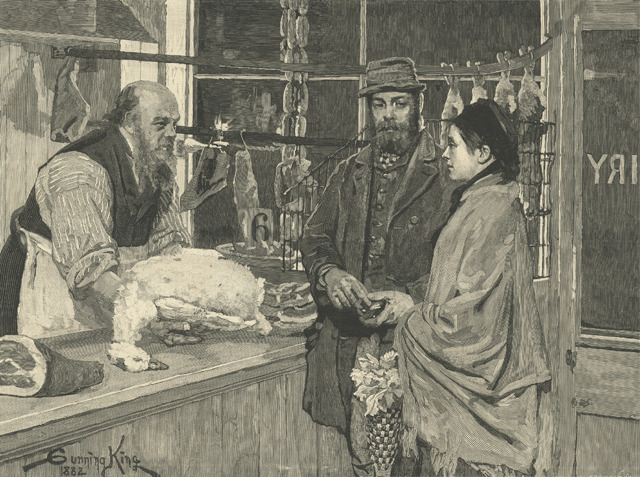 During the eighteen months from October, 1875 until March, 1877, the dressed meat sent from new York amounted to 29,604,670 pounds. The meat sent is invariably the finest Western corn-fed cattle, which are brought alive to this city, and killed just before shipment. 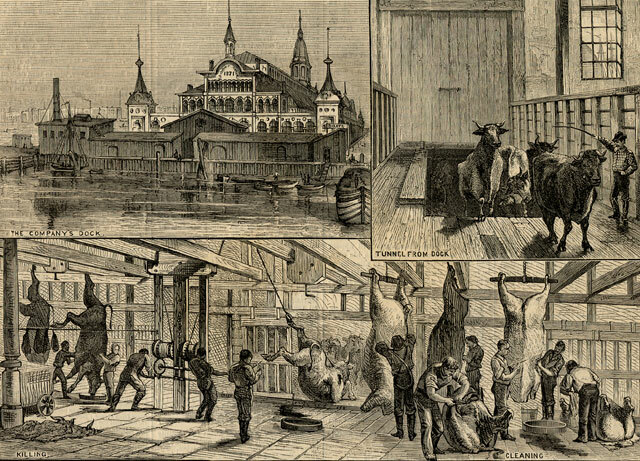 The Manhattan Abattoir/ --- From Sketches by V. L. Kingsbury.